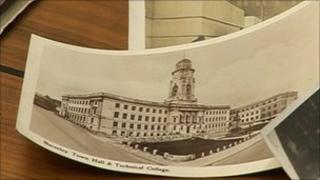 Barnsley Town Hall is closing for more than a year to allow part of the 1930s building to be transformed into a museum. The £3.7m Experience Barnsley project has been mainly funded with lottery cash and will be a mix of exhibitions and an archive centre. John Tanner, project manager, said the town's people had given contributions for the museum over the years. The new building is due to opened in July 2012. Council staff will be moved to alternative offices in the town while the work is under way. Mr Tanner said: "Very, very rarely do museums get brought together from scratch without any existing collections, and that's meant there's been huge potential. "What we've done over several years now is gone out to the people of Barnsley and said, 'What have you got - objects, films, photographs?' and people have come forward in their hundreds."